This reminds me of buildings I’ve been to in Europe – one in Rome, where our office is located, in particular. Trudging up the last flight of stairs, Josef pondered his legacy, while reciting the prayers of atonement with each passing star. Invisible to most at a distance, the grate formed them perfectly, seen clearly in his slow passage, as though the star of his faith guided him to his fourth floor walk up. Legacy was too weighty a mantle for him. That he’d lived to 87 was miracle enough; Dachau a dim memory, his family of ghosts long dead. His steps were their tribute, each star reminding him of those who were lost. It was legacy enough that he remembered. Lovely story – I saw a thousand Stars of David too, but I wrote about another kind of suffering. Thank you, Liz. Will head your way next! That last line sums it all up beautifully. Thanks – that was my hope – I had to rework that several times to get it right. I could feel his weariness, Erin. A lovely but sad story. Thank you, Karen – I felt it, too. The stairs were his time to contemplate the past. Lest we forget. Well done, Erin. Thank you, Janet. I hope we never forget. It wasn’t the first thing I saw, but once I saw it, it was hard to not go there. 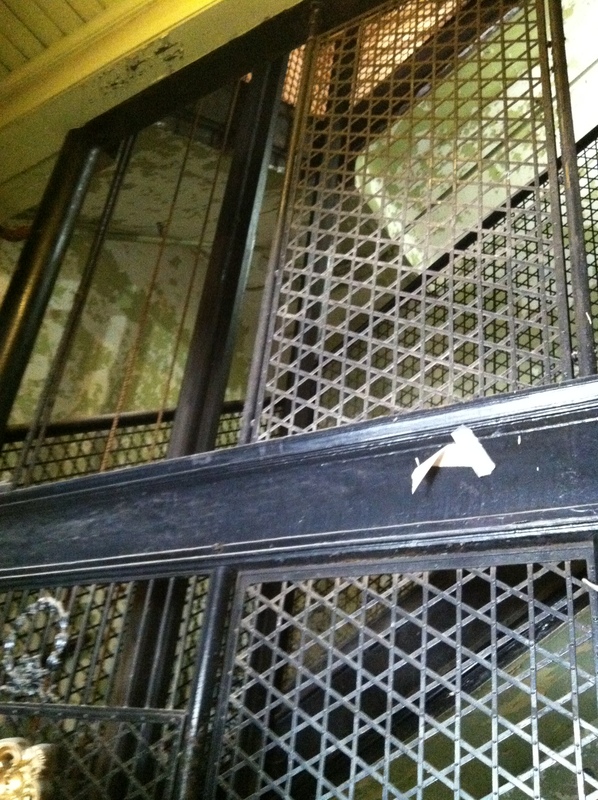 I find it interesting, if not amusing, that many saw the star of David pattern in the grate and wrote Jewish stories. I saw it but chose not to write one. Ironic, eh? Very well done and a beautiful tribute to those who perished. In a few years there won’t be any survivors left to remind us. Thank you. I wondered if it was intentional or not! Once I saw them, I couldn’t go any other direction. Thank you for the great inspiration! Wonderful post. I found myself slowing down my reading to savor the words and the meaning. Great job! Thank you for reading. Your comment made me happy! This story read like a poem. Thank you. Having to pare down to 100 words sometimes does that. Great account and still a need to remind ourselves of those things. I don’t want to be the last to go! Beautiful story and a lovely tribute to those who suffered and lost their lives in that terrible war. Well done.